Printed from http://www.bodytalksystem.com//learn/news/article.cfm?id=1064 on Apr 20, 2019. The term Evidence-Based Medicine, aka Evidence-Based Practice (EBP) was first published in 1992. It has been heavily studied and implemented in many circles of research and professional practice. It is widely considered the gold standard for the quality of patient care within the medical community. There are three principles that constitute an EBP and they are 1) keeping up to date with leading high-quality research, 2) relying on the professional expertise of the clinician, and 3) respecting the client's values. In a true EBP, the clinician will not merely rely on what they studied in school or what is profitable or trending. The mindful clinician keeps up to date about the latest research findings, the outlier studies, and the growing body of evidence that is useful to him or her. The clinician will also rely on his or her expertise that is based on experience, even when that conflicts with published research and guidelines. The attentive and empathic clinician also interviews and informs the client and takes into account what is of value to them before prescribing or administering treatment. These three principles integrate to ultimately produce high-quality client care. The chosen descriptor for the BodyTalk System is Consciousness-Based Healthcare (CBH), or sometimes priority-driven practice. 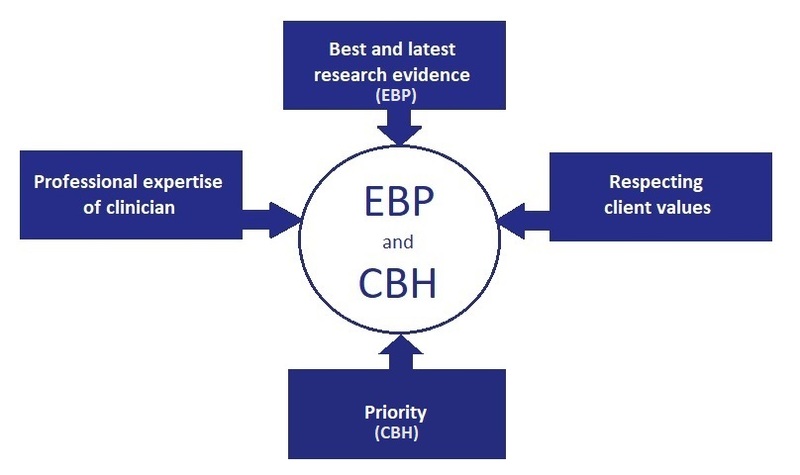 The differences and similarities between EBP and CBH are interesting to note. All peer-reviewed, published research studies have limitations. Each study or analysis was for a specific population at a certain place and time using controlled, independent variables (as much as is possible), and they only measured a few dependent variables, which are evaluated to form conclusions and discussions for future research. A CBH approach is founded on the dynamic principle of Innate intelligence that is operating at this current moment, which is called the priority. It is not founded on circumstances, people, research variables or anything else that is or was factual or accurate at another place, another time and for another person. Priority at this moment is the principle driving force. This CBH process is categorically different and is, by nature, more difficult to study in a controlled research environment. A CBH Certified BodyTalk Practitioner (CBP) follows priority but that does not imply that the CBP is anti-scientific. A CBP follows three parallel principles to EBP. As in EBP, the mindful CBP stays up to date on the latest and greatest relevant information, continues to study and learn, and conscientiously reflects on his or her own clinical and life experience. Most of all, the mindful CBP relies on common sense (as does a good EBP clinician), which could be considered the expression of the underlying three integrated principles. Under both systems, client values are of the utmost importance. Neither research nor expertise are meant to negate a client's autonomy, relatedness and sense of self. A subtle difference lies in the understanding and approach of the practitioner. Values are to be respected. Belief systems are open for challenge – and this is often where priority and common sense must intersect to uphold values at the expense of belief systems. This ability to distinguish values from beliefs gently yet firmly often comes from experience and is heightened during a session when the practitioner is "in the zone." Respecting the guiding and inclusive principal of innate intelligence is perhaps the more artful aspect of a CBH practice. For further development of such insights, please refer to the IBA Life Science training courses. All of this – EBP and CBH – have the end goal of improving the quality of client care within a professional practice. The scientific method has proven itself useful to humanity for many decades. There are other methods which, by definition, are not scientific but that does not imply they are any less useful or valuable. In some or many cases, a non-scientific method may be more useful, more valuable, and of a higher priority. In other situations, the scientific method and its useful findings and practical applications may be the needed factor – the priority. In all cases, let us remember that it is not about the practitioner's clinical results. It is about improving client care, which fortunately happens to be inclusive of clinical results, but not vice versa. Consciousness-based healthcare is all-inclusive to such an encompassing degree that priority may at times favor a non-CBH approach and still be the priority. Be a leader; follow Priority.